We arrived to be greeted by the hotel manager and taken directly to our room by a member of the reception staff. Our room - 386 - didn't 't have the best view in the world (a side view of the next door hotel and limited sea view) but it was not overlooked and got the sun in the afternoon so I could chill out when 'Sir' was having his siesta! The room was large enough with twin beds, bathroom and seperate toilet. The maid kept it very clean and made the usual swans etc. some of them being the best I have seen. The hotel lobby is very impressive and all the public areas are kept up to a high standard. We had no problems with the food, plenty of choice even for a fussy eater like myself. In the evening you had an allocated sitting and table. We always had a wine chiller ready set up with our white wine and water. Of the two speciality restaurants, I would say the Asian was our favourite even though that was buffet service and the Tunisian was waiter service. Again, our wine was ready and waiting for us. All the staff we met were friendly, courteous and always smiling. We only tip on leaving so have to assume that everyone got the same service. 3 nights a week there was a pianist in the lobby - not exactly concert standard - but good enough for us to dance along to. We didn't go to any of the shows so can't comment on those. All in all, a great holiday and we will return. Me and my husband stayed at the Riu Imperial, for 10 nights in July 2012, we travelled with Thompsons. We thoroughly enjoyed our holiday. Lovely, impressive hotel. We found all staff to be friendly and helpful. Great selection of food, we could always find something we liked to eat. We also tried two of the themed restaurants the Mediterranean and the Asian. The Asian was our favourite. The animation team worked hard during the day with activities. Cannot comment on the evening entertainment as this was inside and we preferred to sit outside in the evening. We never had trouble getting a sunbed as the pool man was always on hand to help us. Our Room was pool/sea facing and a good size. Cleaners worked hard and we always came back to beautiful towel art. Would we return? yes definitely. We loved the location, next to the beach, the atmosphere and the staff. We did tip, but believe the service we received deserved it. Having just returned from a week at this hotel I have to say it is beautiful. A complete refurbishment has been undertaken and whilst I was there can honestly say you would never know there was any work going on. The far end of the hotel is where a new wing has been added and when I left they were putting the windows in. The room I stayed in had been completely refurbished along with the reception/entrance lounge, American bar, restaurant and terrace area. In fact it looked like the whole of the hotel and beach bar had undergone a complete overhaul. Can't wait to return in September. 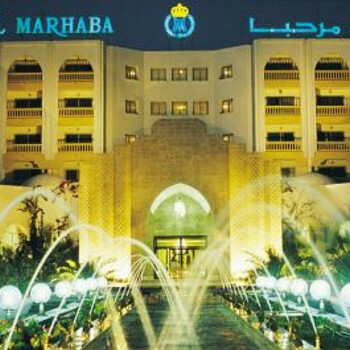 The RUI Imperial Marhaba is a lovely hotel it is very clean and tidy.The towels and bedlinen are attended to every day by the maids. The food is well prepared and presented and is of a wide variety. The hotel is located on the fine sand beach and a 45 minute stroll to the port. Staff are wonderful and will do all they can to help and make your stay as enjoyable as possible. Animation/entertainment was a bit amateurish but they do try very hard and work long hours. All in all a very nice hotel with some nice touches here and there and I would recommend to anyone. We were welcomed at the hotel with a drink and once registration completed were told, for some unknown reason that we had been upgraded to a suite. Fantastic! We were too late for dinner and were told to go to our suite, luggage would be sent up shortly also a tray of dinner. This was a lovely salad. The suite was huge with 2 large beds, 2 bedside tables, 7 armchairs,5 lamps and 2 overhead lights. Bathroom was separate from toilet,carpeted floor, lots of wardrobe and drawer space and lots of mirrors including a full length one. Our beds and pillows were very comfortable with extra pillows and blankets in the wardrobe. Fridge, t.v, and safe were all free as we were A.I. The staff were absolutely the best. So friendly in all departments. The food was very good with lots of choice and the desserts were so fantastic. Lots of fresh fruit too and i would recommend the dates. Our waiter was Ben and I cannot praise him enough. The last night we were there he took me aside and presented me with the most gorgeous pink roses. We also had our table filled with flowers and petals. Only negative would be the distance from the town. The hotel is on the beach and it took us a 45 minute stroll. This spotless, friendly hotel is excellent for a complete chillout as you have everything you would need on site, shop, spa, hairdresser and entertainment. We visited this hotel for a fourth time and Thoroughly enjoyed ourselves yet again. The hotel is always lovely and clean and the cleaning staff always work hard to make our stay more comfortable. The food was very good, but since the Riu groop have taken over it has certainly come down in standard. We have visited the hotel in the past before Riu took it over and the food was of a much higher standard along with other aspects too! We were told by a member of staff that Riu are on a cost cutting exercise and firstly laid of over 100 staff and then cust costs on other things such as air conditioning. On oour first visits the Restaurant was lovely and cool, but this year Riu has told the staff not to use the aircon, using the excuse they are awaiting a part. We were on most occasions eating our evening meals in temperatures exceeding 35-40oc! However, the helpful staff tried to help by opening the doors to try and let in some cooler air. The hotel location is excellent, just a few minutes by taxi from the marina. The hotel staff were very friendly as usual, but we found that there was a little bit of Favoritism towards some of the guests,who's nationalities shall remain nameless! The hotel entertainment was ok, the Animation club was ok, the usual racket at the poolside from around 9:30 throughout the day. I guess most people seemed to like this, but some commented that they would prefer a quiet day by the pool! Also there is some building work in progress at present a Thalasso and Spa being built, which should be spectacular next year. The building noise wasn't too bad, but some days was a bit of a headache. We will definately be visiting the hotel next year yet again. Just got back from two weeks at the Riu Imperial Mahaba and it was excellent. The welcome from the very amiable Hotel Manager was very friendly and really unexpected. The hotel itself is very impressive from the fountains and grounds to the large atrium and glass lifts. The friendly staff are attentive helpful and the rooms are spotless. The rooms are of a good size and the beds are massive (approx 6' 6" square). Each day the beds are made in a differant way, whereby the cover is shaped and sweets / petals left on the pillows. We did transfer from out 1st room as there was temporary building work at the side of the hotel but there was no fuss and the staff offered to pack and move our belongings if required. Unless you are tea total and do not eat during the day then go all inclusive. The dining room is ok though some tables are a little cramped. The food is varied - the breakfast buffet has endless choice of hot and cold items. The evening dinner is varied and should cater for all tastes, including a choice of local dishes to try. The evening 'entertainment' is poor and mainly the hotel staff. There is a nightclub on sight but I'm not sure it is open out of season. The pool area is well maintained and a path leads through the gardens and directly onto a lovely beach. The stroll along the waters edge to the marina is a steady 40 mins. Sunbeds around the pool and at the beach are free. Just stand on the beach and sunbeds are carried / positioned and a padded cover added.